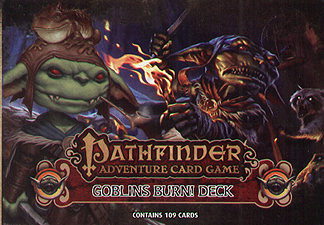 Not content to cut and fight, these goblins are ready to set your gaming table ablaze in the 109-card Goblins Burn Deck. Mogmurch the bomb-thrower and two of his fiery friends are paired with enough spells, bombs, and lucky pet toads to singe, char, and gobble your way throuugh any Pathfinder Adventure Card game Adventure Path. This deck can also be use in the Pathfinder Society Adventure Card Guild organized play campaign.